I have worked closely with one of New Zealand’s most successful direct mail marketers. He’s been in the direct mail business for almost 40 years and made a lot of money. The first time I met him in his office, I was intrigued to see all kinds of advertising material, from all over the world, lying on his desk. He explained, he relies heavily on copying (and adapting) the ideas of other successful direct marketers. And the truth is, virtually everyone in the advertising and marketing field “borrows” ideas from other successful ads. You should do the same. In your case, you are looking specifically for websites that grab your attention and, above all, make you want to buy from them. They may not be in the same field as your business. But you will find headlines and phrases that work effectively and can easily be adapted to your own market. Most professional copywriters collect what they call a “swipe file”. This contains all kinds of advertising material which they can then adapt to fit the particular market they are writing for. 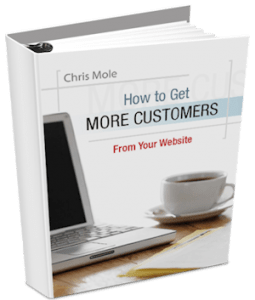 If you are serious about creating a successful website (or websites) collect as many examples as you can from as many different sources and markets as possible. Don’t limit your¬self to websites that only relate to your market. Look at sites in other markets as well. The more you collect, the easier your job will become later. One of the most successful headlines I have written, was inspired by an ad I heard on the radio while driving in the car. A light bulb went off in my head when I heard it, because I could see how it could be easily adapted to fit my own client’s product. Having said that other people’s advertising is valuable source of ideas for your own business, I must add a proviso that it must be tempered with your own common sense, judgement and skill. The reason is, a headline that worked like magic in one market, may completely bomb if you try and use it in the wrong context. And there may be subtle factors in a successful ad, which you may completely miss if you try to duplicate it. So you need to use your advertising ‘nous’ before you blindly copy another ad.